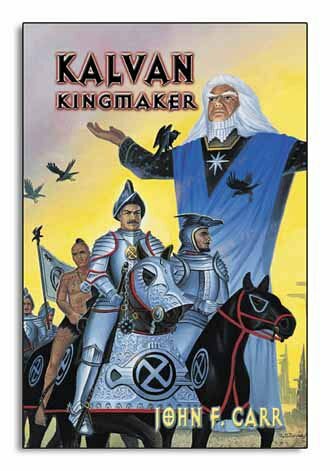 Kalvan Kingmaker is the 3rd in the Kalvan Saga, after H. Beam Piper's groundbreaking parallel world's SF novel, Lord Kalvan of Otherwhen, and the sequel, Great Kings' War by John F. Carr and Roland Green. The Paratime Police patrol an infinity of alternate earths. Their prime directive is to protect the Paratime Secret thereby keeping this infinity of worlds from mixing and destroying each other, or from learning the parasitical Home Time Line is secretly looting their resources. When Penn. State Policeman Calvin Morrison is accidentally dropped off from a cross-time conveyer onto Styphon's House Subsector, he threatens both the Paratime Secret and leadership of the gunpowder theocracy, who owe their power to their secret knowledge of the "fireseed" formula. In just a few weeks, by the use of his knowledge of military strategy, Kalvan saves the small princedom of Hostigos from an invasion orchestrated by Styphon's House. Kalvan Kingmaker opens right after Kalvan's decisive victory over the Holy Host of Styphon. 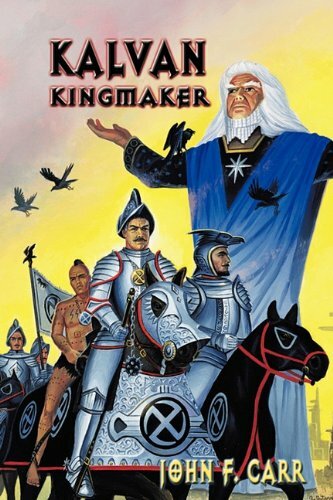 With Great King Kaiphranos of Hos-Harphax in mourning over his eldest son's death, the time is ripe for the Army of Hostigos to invade Harphax and topple the Iron Throne. At the holy city of Balph, the Inner Circle is reeling. Archpriest Roxthar, a rare true believer in Styphon, is conducting a full-blown inquisition of Styphon's corrupt upper priesthood. Once his reformation is complete, Roxthar's next job will to rebuild the Holy Host and defeat and destroy the Usurper Kalvan. Meanwhile, there is a great migration of nomads across the Sea of Grass; they are the wild card. As the nomads pour across the Great Middle River, pushing the clans and tribes that live there into the Great Kingdoms, the big question soon becomes: Will Styphon's House be buried by the human wave, or will they use the nomads in their war to the death with Kalvan and Hos-Hostigos?